Two weeks ago, we quietly rolled out one of our Enterprise plan features for all users inside OptinMonster. Today I’m excited to announce the official release of our Geo-Location addon, plus a number of other new features you’ll love. Earlier this year we added the option to target by timezone. This was incredibly useful to schedule time-sensitive campaigns for users around the world. But what if you wanted to display completely different campaigns based on the geographic location of your visitor? Now you can do that with just a few clicks, with our new Geo-Location addon. This powerful targeting feature will help you boost your conversions by providing the most relevant offers to your users around the world. The Geo-Location addon is available to purchase for Basic, Plus, or Pro users. Here’s how to add Geo-Location to your account. One of the questions we get asked most often is how to use OptinMonster to engage visitors who have already subscribed to your newsletter. A subscriber is just beginning their relationship with your brand. Your goal is to get them to take the next step in the customer journey. 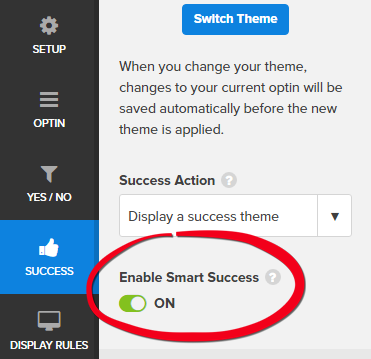 Now you can easily help customers take the next step with our Smart Success Themes feature. After-Post / Inline, and Sidebar campaigns can now automatically display the success themes to any visitor who has already opted in. The possibilities for engagement are endless. Check out our post on how to leverage the full power of success themes for ideas. We’re now using a new and improved secret method to filter out spam submissions. This takes place behind the scenes automatically, so there’s nothing you need to do to enable it. You won’t notice anything different – except fewer spam subscribers for those of you using single optins. If you have multiple OptinMonster accounts or you’re working with clients, then you’ve probably wished for a way to easily duplicate an optin in a different account without having to recreate it from scratch. Now it’s possible to transfer optins between separate accounts. All you have to do is contact our support team and cc the new account owner. Once we have both permissions, we’ll transfer the optins for you. Last but not least, we’re happy to announce that OptinMonster now integrates with ActiveCampaign’s Site & Event Tracking feature. With Site & Event Tracking, you can track your contacts’ actions and behaviors on your website, and create campaign automations, segments and more based on their actions and behaviors. Now you can also use it to track your OptinMonster conversions, keeping all your data in one place with minimal effort. That’s all for this week! Thanks for all your feedback and support. We look forward to helping you improve your conversions.